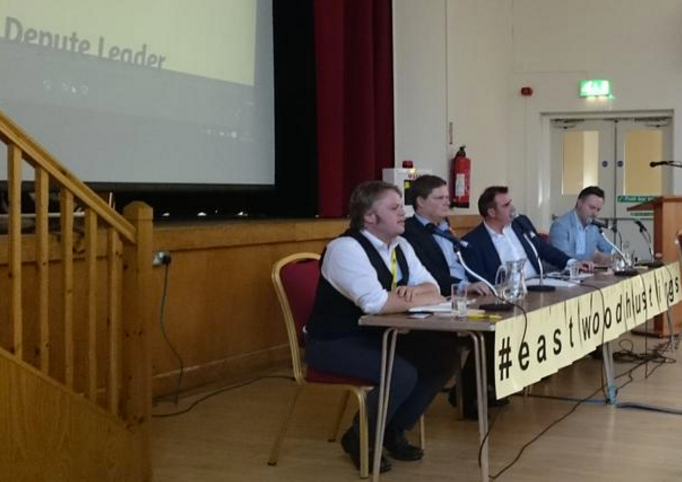 I went along to the Eastwood Hustings last night to get a better idea about who to vote for in the SNP’s election for a new depute leader. Chris McEleny has some decent ideas about reforms to the party structure, but I think the other candidates have listened to these and are likely to implement them, too. However, his focus seemed very strongly to be on local elections, and with the possibility of a new independence referendum, I don’t think this is the right kind of depute for the SNP at the moment. Tommy Sheppard is great and I’m really appreciative of the things he’s done during the indyref campaign and as an MP. At another point in time I can imagine he would have been my preferred candidate. However, like Chris he seemed to focus more on local elections and on the party structure, and again I’m just not sure this is the right time. Paid organisers might be a great idea, but when the next referendum campaign gets called, a lot of activity will probably shift to Yes Scotland 2 (or whatever it’ll get called), and then these organisers could almost become a hindrance. Angus Robertson is one of my heroes. As somebody who’s half German myself I really admire the way he’s explaining Scottish politics in German to German and Austrian audiences — he simply says all the right things, like for instance: “Wir Schotten sind […] Weltbürger — von daher ärgert mich die deutsche Übersetzung meiner Partei: Wir sind keine Nationalisten.” He’s also doing a great job in Westminster, and I’m sure being depute leader of the SNP could help him there. Finally, his point about making sure that the SNP doesn’t lose the rural areas now that the party is becoming much more urban makes eminent sense to me. I’ll be very happy if he wins this election. Alyn Smith is, however, my preferred candidate. His famous speech in the European Parliament has shown he can win over European hearts and minds, and that really matters at the moment. He also pointed out last night that his election will send a strong signal to Europe that the European Parliament matters more to Scotland than the UK Parliament in London, and he can really use the depute leader title to impress on people across Europe that he’s to be taken seriously. Finally, although he didn’t say it, I can’t help thinking that somebody who’ll lose his current job if Scotland gets chucked out of the EU will perhaps work harder to keep us there than those who won’t. Given how much staying in the EU matters to me as a New Scot from another EU member state, I’ll cast my first vote for Alyn Smith. I have come to the same conclusion for some of the same reasons and some different ones. I thought Chris McEleney was good. Before hearing him I had pretty much written him off as someone who was just looking to raise his profile. I’m sure there’s some truth in that as he must know he won’t win, but he put some very good ideas across and spoke very well, so I actually hope it works in that sense. He won’t win, but I’ll be happy to see a bit more of him in future. I thought Alyn was a bit disappointing on the night, but I’ve seen enough of him to know he’ll be a fine Depute if he wins and I agree that having our Depute in the European Parliament would be a very powerful statement that would be well-received there. He’s an excellent speaker, but wise and considered. Win or lose he’s going to be absolutely essential over the next five years. Angus, the establishment candidate in an anti-establishment party! It’s hard to overstate how good a job he’s doing down the road. When he stands up to talk now, they are terrified. He’s clearly doing a brilliant job of marshalling 50 new MPs. My concern will be that nothing changes if he wins. We need serious reform in the party structure, staffing and hierarchy and that’s why Tommy Sheppard is getting my number 1. He has the experience of organising a mass movement and a clear vision of how he’ll do it, and what we’ll be doing in it, which excites me. He’s also the only one with a long term plan for this moment. We don’t think about what we’ll do after independence enough. He’s careful about not mentioning the Labour Party by name when talking about his experience, but it’s an advantage too. Independence will come after we’ve squeezed the Labour Party dry, and only a Labour-man can win over the remaining stragglers. Not one candidate is for leaving the EU, very disappointing. I believe, at least, 50% of SNP members do not wish to sign up to this unelected, corrupt, political cabal. Reference Alyn Smith’s so- called “famous speech” in the European Parliament, my view is “Never stand and beg for that, which you have the power and ability to earn”. I totally disagree. If an independent Scotland left the EU, we would realistically have to join EFTA instead (like Norway and Iceland), which means we’d realistically be EU members without the influence. The Scottish economy is simply too small and too open to be fully independent. What evidence do you have for your 50% assertion? Angus Robertson is indeed a very talented man, but it’s all very well being able to explain the benefits of independence/EU membership in fluent German to viewers of German and Austrian TV and independence more generally on Swiss TV as well, but this is NOT the priority. The priority is convincing the “Soft Nos” and keeping hold of the “Yessers” from 2014. BTW as someone who has a degree in German and a great love of the German language I thoroughly applaud Angus’ sterling work with these audiences. Having said that, Angus’ track record speaks for itself and I do think he is the man for the job.